Yesterday was a day of firsts for me: First time in Kansas/Missouri. First tailgating experience. First time gambling in a Casino. It was a real taste of the culture here in the Mid-West. The day started bright and early with me trying to squeeze into as many layers as possible. We then drove to Arrowhead Stadium, home of the Kansas City Chiefs, where tailgaters had been setting up since 8am. We set up our portable barbecue, lawn-chairs, and blankets to enjoy the pre-game fan fair. There’s nothing like beer and chicken wings for breakfast. Chillin in the Parking Lot! I had a great time at the game with Jennie, her boyfriend Austin, and a few of their friends. Strangely enough, the main event of the game, occurred off the field and way up in the nose bleed seats. At about 1:00pm, a drunk man in the stands wet himself and had to be escorted down the steep stairs by a couple of security guards. It was the ultimate walk of shame. 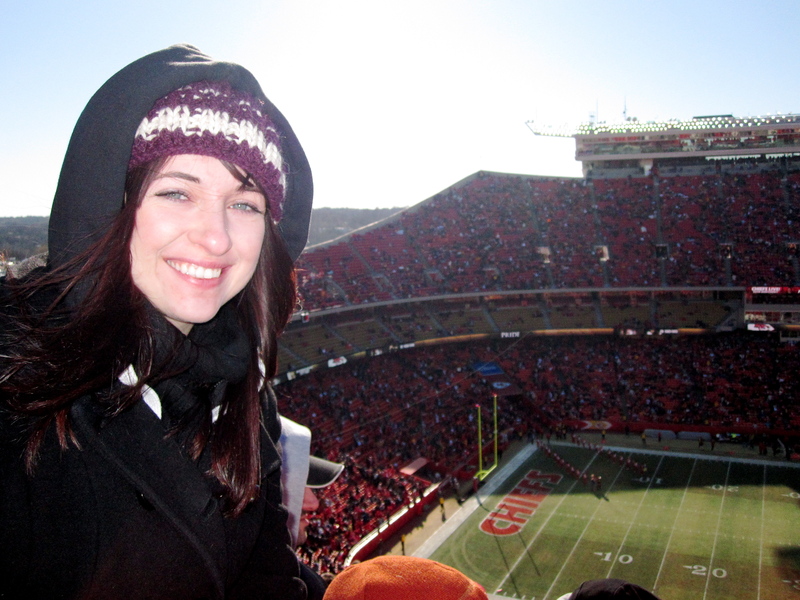 I really enjoyed my first real football game, but in the end the Chiefs lost to the Oakland Raiders 31-10. After the game we headed to Harrah’s North Kansas City Casino for a free night in a suite. We had a very healthy dinner, which included an appetizer of fried pickles (aka heart attack on a plate). After our energizing dinner we decided to gamble our lives away… obviously a good decision. Jennie and I tried a few slots which quickly sucked up our money… so we tried to take a stab at Blackjack. It’s a bigger risk but also has much bigger rewards. All day long we had been mocking Jennie about her unluckiness and she didn’t disappoint. She lost her first $20 bucks on the table in record time. So I pushed her aside and proceeded to win and win and win again until I had turned my $20 into $95. I just love winning. Winning is my favourite. I even shouted “Winner Winner Chicken Dinner!” when I got a blackjack. I now understand how people get addicted to gambling. It was loads of fun and with Jennie as my personal cheerleader, I was on my way to fame and fortune. Although, I can’t take all the credit, the man beside me coached me the whole way… I must be lucky because I was having trouble even counting to 21… yep, my education is hard at work. In the end, Jennie joined the table, and I took a turn for the worse. I decided to quit while I was still ahead and ended up with $40… still not too bad for my first time. Today we are taking it easy and spending time at the Country Club Plaza entertainment district, which is actually really beautiful. According to Jennie, Kansas City has over 200 fountains, which is the second most in the world after Rome. Pretty impressive stuff right? Not too shabby Missouri. This entry was posted in Kansas, North America, USA. Bookmark the permalink. TRAVEL BLOG!!!!!!!! This makes me so happy to read about your travels, just knowing you are blogging makes me happy, and makes me think of our wonderful adventure so scrupulously documented by you! Love you!